Posted December 15, 2006 in 1 Early, 2006/12, Early Jack Kirby, Periods, Serial Posts, z Archive. I have previously done a serial post on The Art of Joe Simon. It would be great to produce an outline of Jack Kirby’s art and how it evolved over the years. However the sheer volume of Kirby material makes such an approach impracticable. Although probably not completely accurate, my database shows that between 1942 and 1957 (that is from the start of working for DC until the time Jack started doing freelance work without Joe) Kirby did 5593 pages of art compared to 184 by Simon. To avoid the problem of an over abundance of work I will instead do some serial posts each focusing on particular periods, this one will be on Jack’s early years. As when discussing Joe Simon’s early work, I am faced with limited access to the publications, they are both rare and expensive. But hopefully I can provide enough to give a general idea of Jack’s early work. 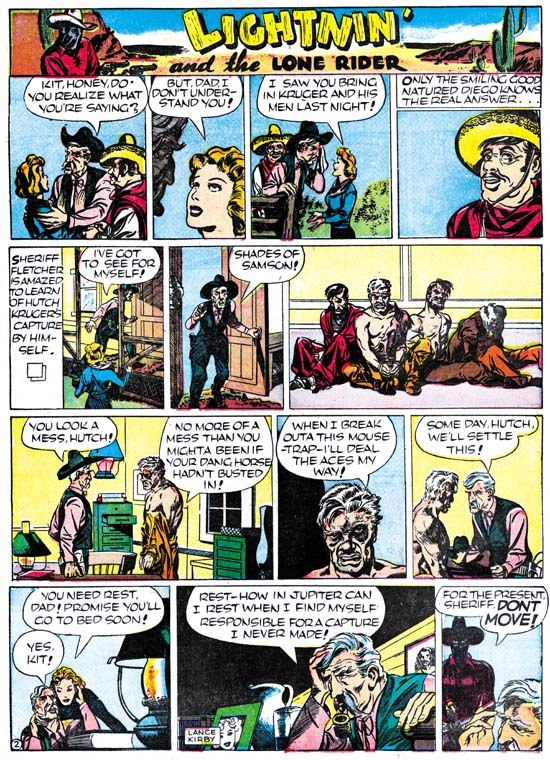 Jack Kirby became a staff artist for Lincoln Features Syndicate in 1936 and stayed there until 1939. Most of his strips can be described as comic humor (for example Socko the Seadog, a take-off of Popeye). Jack also did a lot of “real facts” art (for instance Your Health Comes First). Unfortunately I do not have access to any of this work. Those truly interested in this very early work can find it in the recently published “The Comic Strip Jack Kirby” by Greg Theakston. However some of Jack’s syndication work included some strips with more action and, even better, some of these got reprinted in comics. One, Lighting and the Lone Rider was a daily that appeared in January and much of February 1939. This material was reprinted in Famous Funnies #62 to #65 (September to December 1939). Jack used a number of alias during these early years, here he signed them as Lance Kirby. 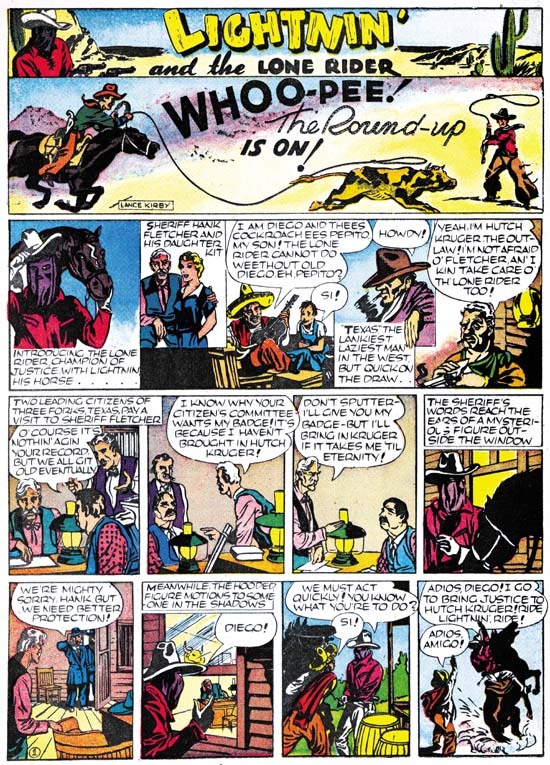 Prior to running the strips, Famous Funnies #61 ran a number of advertisements announcing the appearance of the Lone Rider in their next issue. One ad is particularly important in that it took up a full page. Prior to teaming up with Joe Simon, Jack never did any comic book covers. This full page ad is the only thing we have to compare with some of Joe’s early covers. Like a cover this ad was meant to attract readers, although in this case to the purchase of next month’s issue. One would expect great effort to make this ad interesting and exciting as possible. Instead we find a rather lack-luster piece of comic art. Joe’s earliest covers were much more interesting. As we will see below when we examine his story art, it is not a question of Jack’s lacking artistic skill. One possible explanation is that all his previous work on syndication strips just did not prepare him for the challenges of a single larger piece of comic art. Another suggestion is that already at this early stage of his career, Kirby had developed a preference of story telling over cover art. Daily syndication strips require a different story telling pattern then that found in comic books. Whereas a comic book advances the story page by page generally 9 panels to a page, daily strips must tell the story a strip at a time with usually 4 panels. Further a comic book story is meant to be read in one sitting. A daily strip is read one strip at a time over a period of weeks or months. A strip artist must be careful to keep each day’s installment interesting or risk loosing his audience. Jack uses his first strip to just introduce his characters. Frankly I am not sure this was necessary or even a good idea. It probably would have been better to just get the story going and let the cast show up as required. But most peculiar is that there are two characters, Pepito and Texas, that do not appear in the story that follows. But, but why did you do all this? Sheriff Fletcher, my actions are only answerable to myself! Jack would use this sort of laconic and enigmatic response throughout his career. This is not fully developed Kirby art. Fight scenes in particular lack the classic Kirby touch. But even with the small panel size and poor printing quality of Famous Funnies you can see Jack’s talent begin to shine through. Look at the beat-up Hutch in panel 2 of the third strip above, what a miniature masterpiece. If you remember I said that Kirby introduced two characters, Texas and Pepito, that did not appear in the story. 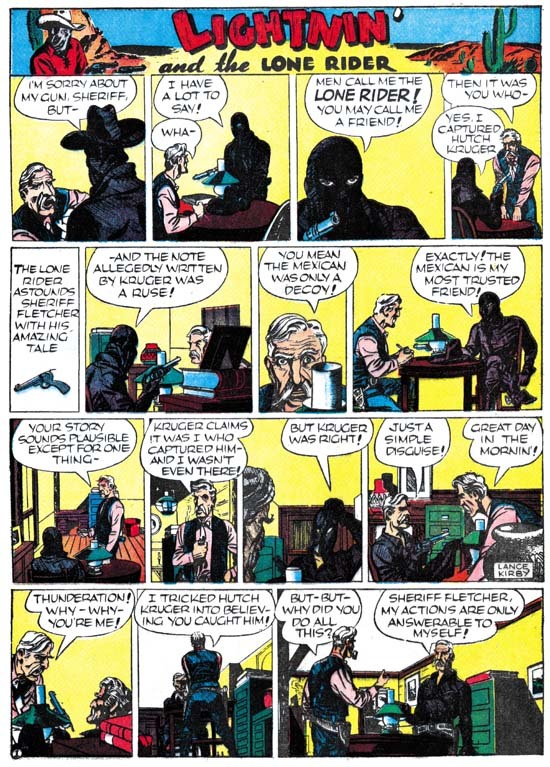 Well The Comic Strip Jack Kirby includes some Lone Rider strips that were never published. In it we find Texas, so in the beginning Jack was already setting things up for next story line. There is also a young boy that Texas calls “little Pete”. At first I thought that Jack had changed his mind about using Pepito so that he changed the character from Diego’s son to that of a rich man. But on reflection it occurred to me that Jack might have been setting up a Prince and the Pauper sort of switch between Peter and Pepito. Unfortunately Jack did not proceed far enough with the story for us to ever know. 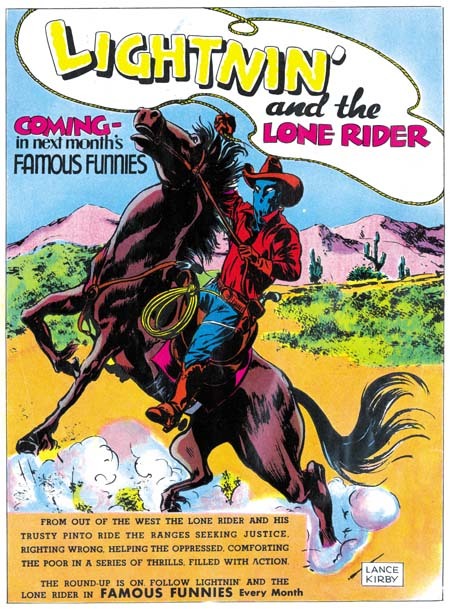 Although Jack never completed his second story line he did return to do some more work on Lighting and the Lone Rider. But there is a reason I want to discuss that work in another chapter.